Infrastructure investments form a key part of the “agenda” President Trump (seen above) laid out in his State of the Union speech on Feb. 5. 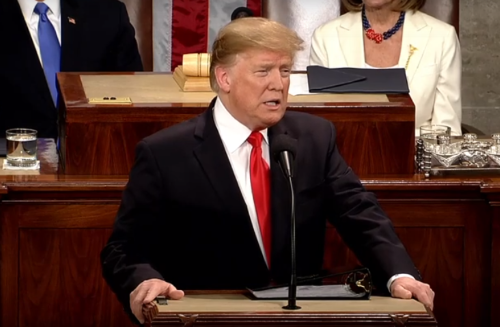 “Many of us campaigned on the same core promises: to defend American jobs and demand fair trade for American workers; to rebuild and revitalize our nation’s infrastructure; to reduce the price of healthcare and prescription drugs; to create an immigration system that is safe, lawful, modern and secure; and to pursue a foreign policy that puts America’s interests first,” the president said in his remarks. President Trump stressed in his speech that “both parties” should be able to unite for a “great rebuilding” of America’s infrastructure. Tom Donohue, president and CEO of the U.S. Chamber of Commerce, doubled those stakes in a speech during his organization’s annual Infrastructure Summit in Washington D.C. on Feb. 5: calling for $2 trillion in infrastructure investment over the next decade. And, according to a new national poll conducted by Rasmussen Reports for the American Road & Transportation Builders Association and American Public Transportation Association, there is strong public support for passage of a bipartisan infrastructure measure in 2019. “This survey demonstrates once again that public support for federal investment in traditional infrastructure programs is broad and transcends partisan politics and ideological divides,” noted Dave Bauer, ARTBA’s president and CEO, in a statement.